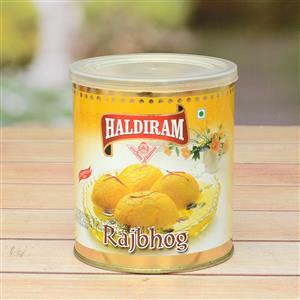 Send Rajbhog Haldiram - 1 Kg to Chennai. Gifts to Chennai. Send Sweets to Chennai. Description : Made up of milk, sugar, saffron, cardamom, rose water and pistachio, this tin weighing one kilo consists of 8 pieces of Raj Bhog. Net Weight - 1200 grms. You can send this tin of delicious sweets to Chennai with other Gifts to Chennai with the help of Gift2Chennai.com.